Steph took home the $2,500 grand prize at Core City: Cleveland Pitch Competition, which supports 10 entrepreneurs that live or own a business in the city of Cleveland during our third annual Core City: Cleveland Pitch Competition. From first timers to seasoned veterans, each finalist pitches his/her business idea to a panel of judges—in four minutes or less for a chance to win $2,500. All participants take home $500 to grow their businesses. Stephanie Buda of The Kids of 216 and Ali Lukacsy-Love of Give Box Cleveland, both who pitched their ideas at Accelerate, are working together to create the prototype for the many Little Free Pantries that will debut in Cleveland this summer! On February 22, 2017, Stephanie Buda pitched her idea for renewing inner-city families by restoring homes for working families in neighborhoods where commercial and public buildings are being upgraded but homes are not. Since Accelerate, Stephanie moved forward with her dream – a summer school and youth employment program. 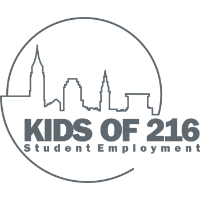 The Kids of 216, launched in summer 2017 with 20 students from various Cleveland Metropolitan School District high schools. The kids were employed as “pre-apprentices” to learn skilled trades in construction. She has paired with the Cleveland Metropolitan Housing Court and other organizations to identify disabled residents, seniors, and low-income family homes to rehab and renovate the homes in order to meet code violations. The program had 20 paid student-employees who are either not on track to graduate high school, have dropped out, or are not interested/academically eligible for a traditional college degree. All the students received an OSHA 10 certification and now learn skills in construction by working on projects for low-income families, seniors, and disabled residents whose homes have code violations or are in need or immediate repair. The students are also going to “field trips” to local companies that hire young adults of their background to see what it takes to work at each place and have been hearing from guest speakers on topics from financial literacy to job readiness to motivation and overcoming challenges at work. The Kids of 216 has garnered local media attention. The program was featured by The Plain Dealer on August 6, 2017, and some of the students were on 90.3 WCPN ideastream® August 9, 2017 to talk about the experience. Follow The Kids of 216 online, and on Facebook.